Hi there! You read a little bit about me already, but I thought I would share a little more. I am 30 years old and have been in the horse industry in one way or another for most of my life. I have worked with several horse trainers over the years to develop my own methods that so far have been successful for me. I enjoy working with the youth in our industry, helping them develop their own horsemanship skills by feeding their passion for our way of life. Barrel racing is my passion and reining is a bit of a hobby for me. I use the reining foundation to make my barrel horses solid animals that can be used outside the arena. I take my time with each individual insuring they understand a step before moving on. 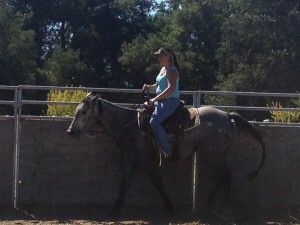 Each horse is different and I want to help you learn how to ride your horse. I want to help you build your confidence and trust in each other, so that you can have a successful career in and out of the show pen!